Subquantum kinetics is a novel microphysics paradigm that incorporates concepts developed in the fields of system theory and nonequilibrium thermodynamics. One of its distinctive features is that it begins at the subquantum level for its point of departure. By comparison, conventional physics and most alternative physics theories begin with mathematically quantified observations of physical phenomena at the quantum and macrophysical level and attempt to deduce physical theories based on those observations. Since the conventional approach must take into account numerous experimental observations, the end result is a fragmented and often contradictory set of theories which must later be sewn together with mathematical acrobatics. Such “unified field theories” more closely resemble a patchwork quilt than a contiguous fabric. Instead of beginning with physical observations, subquantum kinetics begins by postulating a set of well-ordered reaction processes that are proposed to take place at the subquantum level. Collectively, these reaction processes compose what is termed the transmuting ether, an active substrate that is quite different from the passive mechanical ethers considered in the eighteenth and nineteenth centuries. It further proposes that the concentrations of the substrates composing this ether are the energy potential fields that form the basis of all matter and energy in our universe. The operation of these ether reactions causes wave-like field gradients (spatial concentration patterns) to emerge and form the observable quantum level structures and physical phenomena (e.g., subatomic particles with mass, charge, spin, and force field effects and electromagnetic waves). So, subquantum kinetics: a) begins with a mathematical model of subquantum processes; b) it then computer simulates this model to generate quantum level phenomena; and c) it compares the model’s simulated results to actual observations. The model’s mathematical parameters are then “fine-tuned” so that its simulated results accurately reflect experimental observation, thereby making the model a realistic representation of the physical world. Because, it begins with a single reaction system model as its point of departure for describing essentially all observable physical phenomena, subquantum kinetics qualifies as a unified theory. By comparison, conventional physics begins with many theories conceived independently from one another and later attempts to “sew” these together. But the result is far from unified, being instead a self-contradictory aglomeration. In choosing an adequate model to represent subquantum process, subquantum kinetics turns to the macroscopic natural world, to theories describing how certain reaction systems spontaneously evolve well-ordered wave patterns. 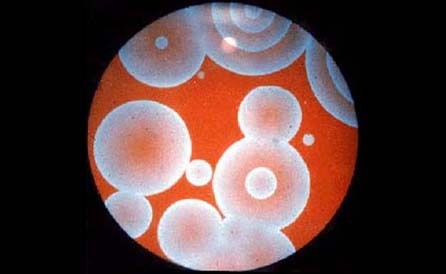 This self-organization phenomenon, for example, is seen in the Belousov-Zhabotinskii reaction, a chemical reaction first discovered in 1958. Slowly moving concentration fronts called chemical waves, or “reaction-diffusion waves,” can be discerned when a dye indicator is added to this reacting solution. spiral and concentric in the Belousov-Zhabotinskii reaction. Wave patterns and wave motion may also be produced mechanically, as is commonly experienced in the movement of water waves or in the vibrations of a violin string. Early physical theories, in fact, proposed mechanical ether models in an attempt to describe phenomena such as light wave propagation. However, such models lead to very different assumptions about primary creation. a mechanical universe could not arise spontaneously, instead requiring the miraculous injection of an initiating energy impulse inexplicably arising out of a state of non-existence. Such mechanical models are inadequate for the approach outlined here which postulates an orderly and explicable process of creation. Subquantum kinetics was partly inspired from work done on a reaction kinetic model known as the Brusselator. This two-variable model holds the distinction in the field of reaction-kinetics of being an archetypal reaction-kinetic oscillator comparable in simplicity to the simple harmonic oscillator of wave mechanics. That is, it is the simplest reaction system known to produce wave patterns that have well-defined wavelength properties. To arrive at a model that produces a physically realistic simulation of quantum structures, the Brusselator must be modified into the three-variable reaction system known as Model G. Hence in proposing Model G as a descriptor of the subquantum processes that generate physical order, subquantum kinetics takes concepts that have been developed in the well-established field of nonlinear chemical kinetics and applies them to the domain of microphysics. The subquantum kinetics paradigm avoids many of the pitfalls of conventional physics and astronomy theories and interprets physical phenomena in a distinctively different manner. A listing of the numerous problems of the conventional paradigm and how subquantum kinetics resolves them is presented in the following tables.